This report will find the athlete's best time in a date range and compare it to the meet selected. The report will list if they improved and the percentage of improvement and it will also show those times that have not improved. New CMS users: In the side menu click Events & Competition > Time Reports. Click Single Meet Improvement link. 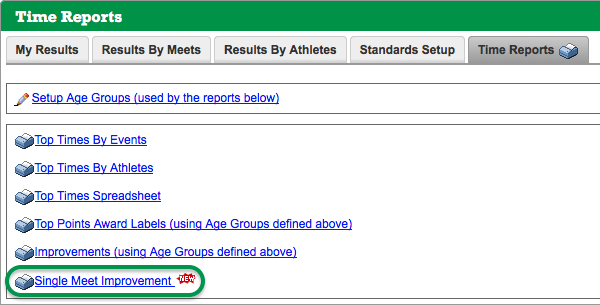 Select Your Meet — Select your meet in the dropdown to see if your athlete improved from their last best time for a stroke & distance. Baseline: Best times from/to — Enter in your date to compare this meet to. The system will start on this date and find the best time for each stroke & distance after and compare it to the selected meet for possible improvements. Your end date will be the date of the meet if left blank. Output Format — Select whether to output on-screen or PDF. 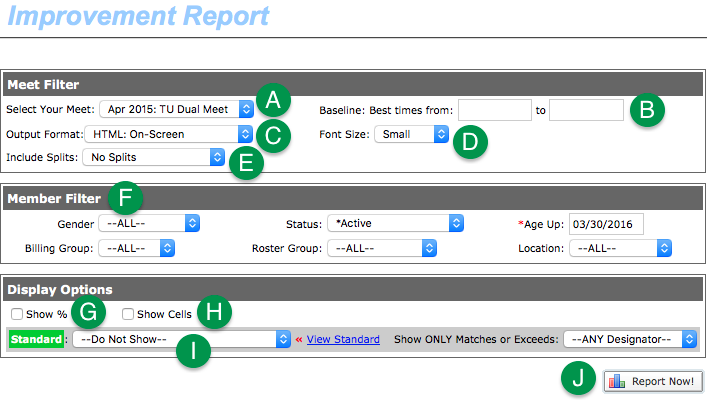 Font Size — Choose how big you want the font on the report. Include Splits — You can choose No Splits, Cumulative (Running) or Subtractive (Lap). Member Filter - Select as desired. If you want all athletes in your database, even those Canceled/Hidden, select --ALL-- for Status. Show % — Displays the percentage improvement when checked. Show Cells — Displays spreadsheet grid lines when checked. Standard — Lets you compare with a selected time standard. As in other reports, you can Show ONLY Matches or Exceeds a selected designator from the time standard.